Welcome to the new Hampton Inn - Suites Southern Pines-Pinehurst hotel. This North Carolina hotel features 68 guest rooms 35 suites an indoor pool and Conference Center. 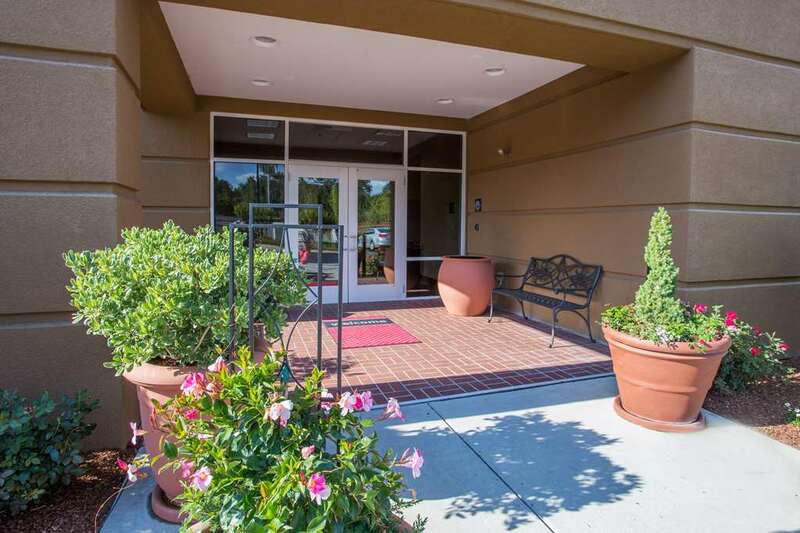 Conveniently nestled in the **Heart of Golf Country** in Aberdeen North Carolina the new Hampton Inn - Suites offers meeting space to accommodate the corporate community and wedding functions with outside catering services available. Meeting facilities include an Executive Boardroom and three Meeting Rooms /over 3000 square feet/ with audio/visual capabilities to meet all of your conference requirements. Our Hampton Inn - Suites Southern Pines-Pinehurst hotel offers spacious modern accommodations and amenities for the business or leisure traveler. Our amenities include complimentary hot On the House breakfast or On the Run Breakfast Bags complimentary USA Today newspaper WiFi access and complimentary local telephone calls. Coffee makers hair dryers and iron/ironing boards are standard in all guestrooms. Select suites feature a wet bar flat-screen televisions and a whirlpool tub. Enjoy our warm inviting lobby area with plush seating in an attractive living room setting with a fireplace which makes your stay with us seem like home away from home. While at the new Hampton Inn - Suites Southern Pines-Pinehurst hotel relax in our sparkling indoor swimming pool use our Fitness Center with state-of-the-art machines print important documents in the Business Center or just enjoy a beautiful day on our open sun deck. Whether business or leisure brings you to our hotel in North Carolina you can rest assured knowing that you will have a good night*s sleep on our Cloud 9 beds receive pleasure from an excellent cup of fresh coffee experience superb custom service and have 100 Satisfaction Guaranteed. We love having you here at the Hampton Inn - Suites Southern Pines/Pinehurst hotel in Aberdeen North Carolina.